Pretentious food … or who gobbed on my meal? I don’t get this whole “foam” food thing. I’m not a fussy eater. Heck, I’ll try anything that doesn’t have a deceased animal in it. But when this dish showed up in front of me on our trip to San Francisco last month, it did take me back a second. On the menu, this was listed as “vegetarian option upon request” meaning if you were vegetarian, it’s what you got – the other options for vegetarians were to go hungry or go carnivore. But to me, this doesn’t look appealing. Does it look appealing to you? 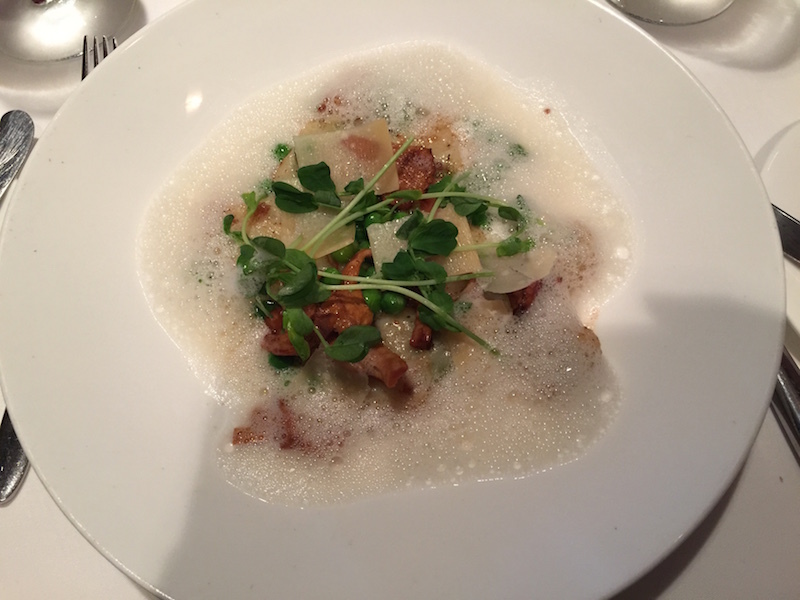 The gnocchi, mushrooms and peas would have been perfectly fine sitting on the plate without the bubbles of foam. The fact that the meal was actually delicious was its saving grace. It just seems overly pretentious and unnecessary. If the food is good, it doesn’t need fancy gimmicks. Hold the foam. Funny and I agree, hold the foam. I do admit I would enjoy any fancy and even pretentious meal any day, but yes, hold the foam. Your a,b, and c reasons made me laugh. I feel like b is totally plausible! To say the least, the foam is weird. Foam is pointless but edible soil garnish is even more ridiculous! It was actually pretty tasty, except for the foam which didn’t seem to have any purpose at all. Yeah that looks pretty friggin gross. Maybe it wasn’t vegetarian. Maybe the foam was what you see with frog spawn. Maybe! But at least you liked it. I think you must be very brave or just a little silly.